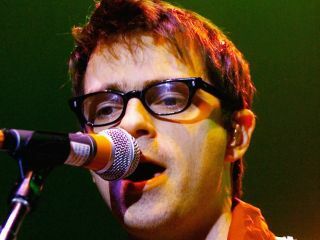 Weezer's Rivers Cuomo: "How can I marry rock with hip-hop?" Weezer's new album Raditude, due out 3 November, finds the band exploring some previously unchartered territory, as heard on their head-turning collaboration with rapper Lil Wayne on Can't Stop Partying. There's even a authentic take on traditional Indian music, Love Is The Answer, that is bound to have the late George Harrison smiling somewhere. Produced by an array of boardsmen (some of whom lent a hand in the songwriting) - Butch Walker, Jacknife Lee, Dr Luke, and Polow da Don - it's Weezer's strongest effort since their self-titled 'comeback' album of 2001 (otherwise known as 'The Green Album'). It's a record of bold experimentation but one still brimming with enough catchy-as-hell hook-o-ramas to keep the multitudes happy. In this exclusive interview with MusicRadar, Cuomo discusses the state of Weezer and the making of Raditude. Congratulations, Rivers. Raditude is excellent. "Oh, hey, thanks. I'm glad you like it. I love it myself." Well, one would hope you'd like your own album. The other day you explained your definition of the word 'Raditude,' but I understand that the actor Rainn Wilson actually came up with the title. "Yes, that's true. I was telling him about the album and how it's fun and rocking, and I asked him what he thought a title should be. He just said, 'Raditude.' After he told me the title, which I liked immediately, I applied my own definition to it. It just seemed to fit. Raditude. It's all right there." The band's lineup has been fairly consistent for a number of years. However, Josh Freese has been drumming for you live and he's on several cuts on the record. Is he a permanent member of the band now? "We don't know. It's hard to say anything is permanent in Weezer world. Right now, our drummer, Pat Wilson, is excited to play guitar, so we're excited to have Josh. It's hard to say where things will go." What was the evolution of Pat moving away from the drums, and is that something you encouraged? "Yeah, we don't like to rest on our laurels in Weezer. We kind of look inward and say, 'OK, what do we want to do now? What would make the band better?' Pat's been playing the guitar a lot backstage over the years and he's gotten really great at it. "He's a musical guy and he has so many ideas. We talked about it, and as it turns out, I've been wanting to put the guitar down a little more and run around the stage like David Lee Roth [laughs], so it's worked out well." Aside from being an all-around amazing drummer, what specifically does Josh Freese bring to Weezer? "He's just so solid and dependable. The guy hits hard but he has excellent taste. Plus, he's a fun guy. He smiles a lot - I like that. He's just a fantastic guy to have around." You mentioned your Les Paul Jr and how much you love it. What amps did you use on the record? "Modified Marshalls. Sometimes I use Diezels. That's pretty much it." On the song Can't Stop Partying, you work with the rapper Lil Wayne. How did that come about? "That was a real interesting challenge. I wrote it with Jermaine Dupri. The whole idea was, 'How can I take my rock guitar approach and marry it with hip-hop?' The combination of me, Jermaine Dupri and Lil Wayne worked beautifully. We came up with something none of us would have come up on our own. It's probably my favorite song on the album." Would you say you're a hip-hop fan? "Yeah, I'm a huge fan. Obviously, I haven't done a lot of it on Weezer records. [laughs] But this one worked. Any other rapper wouldn't have done justice to the song." It's funny, because I read the lyrics - "Monday to Sunday I hit all the clubs/ And everybody knows me when I pull up" - and I can't tell if you're being ironic or not. "Well, people have been saying that about Weezer all along. But the thing about Can't Stop Partying is, it's got a dark side to it - like, maybe it's not a good thing that I can't stop partying. [laughs] Lil Wayne totally caught onto that and delivered the right bit of edge." "The last song? Cool. Now I know you listened to the whole thing." "Wow, that's a big compliment. Thank you so much. That was a big song for me. The basis for it, however, isn't very unique: I had this wicked crush on a girl, but she had another boyfriend and there wasn't anything I could do about it. The relationship just wasn't gonna happen. So I went home and wrote the song. I had to let it go." Are we talking recently? Because you're married now, and you have a kid. "No, no. This was probably back in 2004. It's a bit of an older song. It's been sitting around a while. I'm not always ironic. I do write love songs." Speaking of, there's the track called Love Is The Answer, which uses Indian instrumentation. George Harrison would've definitely approved. "I liked bringing in Amrita Sen on vocals. That was the last step of the process in recording the song, and she really brought it to another level." What would you say is your best guitar solo on the record? "I don't do any of the solos. If I had to pick a great solo, however, it would be on the song Tripping Down The Freeway. I sort of sketched out the idea for the solo and Pat Wilson played it." Pat played it? Wow, it's terrific. "See? I told you, he's getting pretty good!"